Home > Overview > Will Gluten Always be Listed as an Ingredient? A gluten allergy is a food allergy that affects both children and adults. it is quite common in the UK affecting an estimated one in 110 adults and one in 160 children. Unlike some other food allergies a gluten allergy may not always have an immediate reaction after consuming gluten. A person with a nut allergy for example may suffer a severe and immediate reaction after consuming a product that contains nuts. This can include difficulties breathing and a rash. With gluten allergies it is possible to consume a gluten-based product and not feel an immediate or severe reaction. They may have a bit of a headache or feel a little bloated and may not automatically associate this with the gluten he or she consumed. If you had a nut allergy but wasn’t aware of it you would soon realise since every time you ate nut-based products you would suffer the reaction. Since this is not always the case with gluten allergies it can be difficult to detect the illness. Thankfully though, once you have been diagnosed with the illness knowing where to avoid gluten is not difficult. Gluten should always be listed as an ingredient in products bought at the store. As with all the ingredients in the product it should be clearly listed so the buyer is well aware of what he or she is consuming. If you buy your products at a farm shop or store that does not label foods in the way supermarkets and grocery stores might then you should speak with the owner of the store or the manufacturer of the products. if the products are not made by the owners of the shop they may not be aware of the ingredients. Where this is the case and when it is not possible to speak to the manufacturer you should leave the product. 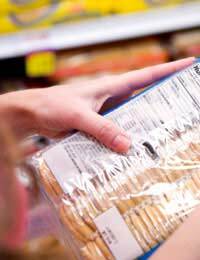 It is not worth taking the risk when you are unaware of the amount, if any, of gluten in the product. When eating out you'd not get the chance to look at the ingredients in every dish. The menu may point out the main ingredients and will probably tell you if there are traces of nuts in the meal but many do not inform diners of whether or not there is gluten in the dishes. If you are at a restaurant and you are unsure as to whether there is gluten in the food you are about to order always check with the waiter. He or she can check with the chef and inform you what meals you can eat and what meals you should avoid. Having a gluten allergy needn’t change your life. There are plenty of products on offer which are gluten-free and as long as you are careful you should be able to carry on as normal, just making changes to your diet. Gluten allergies can be a pain but don’t let them rule your life. Education is key and if you do your research you will soon be a dab hand at knowing how to manage your allergy.